What did the Vikings wear? The giveaway is now closed. Thank you so much for participating. Winners will be announced shortly. Hi guys! I´m Sølvi, and I blog over at delfinelise.com. I live in Norway, and for many years now, I have spent my summers working at an outdoors Viking Age museum at Kaupang in Norway – the first town of Norway. Although, admittedly founded by the king of the Danes. I tweeted Gillian when she launched the Shieldmaiden Sewalong about contributing – and here I am! I hope you´ll get some helpful hints and tips about sewing and crafts in the Viking Age. This is not a small topic, so settle in for a lengthy post. But – there is a giveaway at the end of it! Today we´ll get to know these mysterious peoples defined as the Vikings, and we look at what materials they had at hand for making clothing. 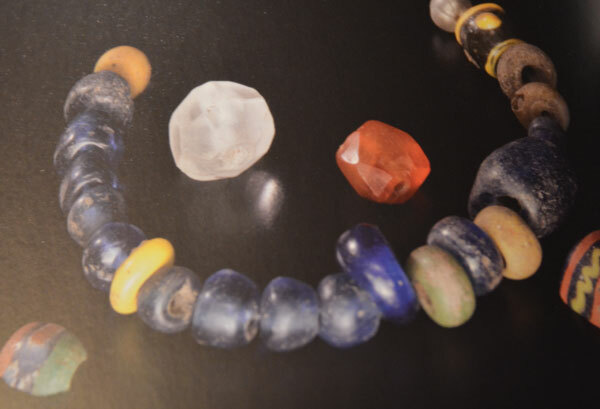 Original Viking Age glass beads, rock crystal and carneol beads. There are very few ancient peoples that has a reputation as bad as the Vikings. But really, theoretically speaking, the Vikings are really just the tribes who lived in what we now call Scandinavia. Some historians will also include the peoples living off the coasts of the Baltic sea, as well as some of the tribes on the British Isles. The Viking Age is defined by when these peoples of the North started to interact with the peoples of other countries, from around 750 AD. We usually count the Viking Age to end more or less when the whole of Scandinavia, officially at least, was Christianized, around 1050 AD. The Vikings were fine craftsmen and women, and they were expert seamstresses, weavers, embroiderers, spinners, bead makers – you name it! 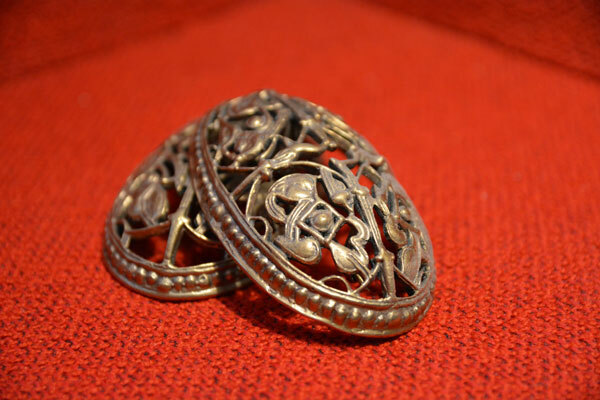 A pair of oval brooches – very popular amongst Scandinavian women in the Viking Age! The Viking Age clothing differs in many ways from that of the Medieval times on continental Europe and the Middle East, and of course even more so from general fantasy sewing. Also, as the findings of textiles and women’s arts are very limited from this period of time, everything I write is my interpretations. Please do ask me for sources if you are interested in reading on! First of all remember, the Viking Age is magical times. Everything you see, do and think might be connected to something magical. In fact, the magical stuff is so normal, that people really didn´t see the difference between what we now think of as “real” and what we think of as fantasy. This affected crafts in many ways – patterns, colors, inscriptions – everything had a double meaning in those times. I´ll give you an example. 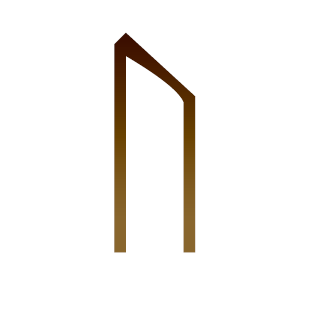 The rune you see above is the letter U/V in the Old Norse language. But it has a name – Ur – and it represent the primal force in the World. It will help in matters of sickness, health and in disputes. It has a creative power, and it can also be a sign of new beginnings. And that is just some of its powers! The few who knew how to really interpret the runes were very powerful people -and many of them were women! What does this have to do with sewing, you ask? Well, if you, for instance, were looking for more luck, knowledge or courage, then you could embroider in some specific patterns or letters into your garments. Animals also held different powers, so if you could get a hold of the feathers of certain birds or the tooth of a boar, those would give you powers too. If you wear the fur of a bear, you were though to be protected by it´s strength, and some of its powers would transfer to you. In our time, we have a giant range of materials to choose from. From man made to natural. Most of the fibers used in the Viking Age are actually still common today. But most importantly – they didn´t have cotton. Cotton has been used by humans for ages, but didn´t spread in Europe until the Muslim conquest of the Iberian peninsula – this happened during the period we count as the Viking Age (ca 750 -1050 AD), but news travelled slower back then, you know, without the Internet and all, and there are no traces of cotton in Viking Age graves. Wool – used for everything. Dresses, cloaks, tunics, accessories, sails. You name it. Linen – perfect for underpinnings, dresses, tunics, accessories and more. Fur – although the climate in Scandinavia actually was warmer back then, the winters could still be cold, and fur was great for bedding and outerwear. Leather – pants, jackets, belts, bags and more. Hemp, nettle etc – strong, robust natural fibers for work clothing, ropes, tents and more. Silk – a bit more exclusive used for tunics and dresses, and for embellishment, trims etc. Also good for sails, in fact. Metal – used for embellishing and for armor. 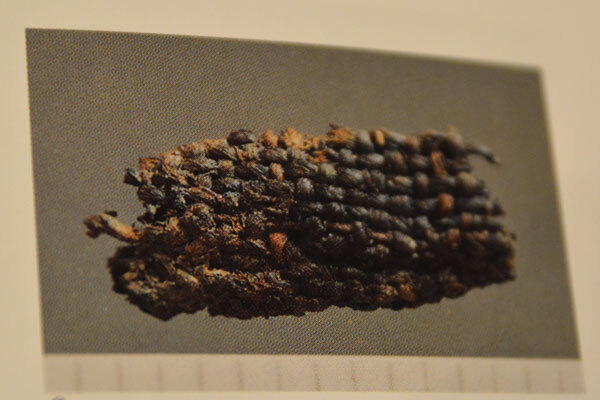 A teeny-tiny fragment of fabric found in a Viking Age grave near Uppsala in Sweden. The best way to search for inspiration for Viking Age costumes, is to google it, or use the shared Sewscialist Pinterest board. There are some great sources out there, from re-enactment groups to museums. What you should look for is layers, a simple cut, natural fibers and colors. Anyone wearing a helmet with horns is waaay off…. This link (PDF) is a great starting point to construct your very own Viking Age outfit, and I would recommend taking a peak at more of the Viking Age boards at Pinterest. Lots of lovely stuff! One thing you should know, is that the Vikings really were quite vain, and loved jewelry, beads, silver and embroidery. So feel free to go nuts! 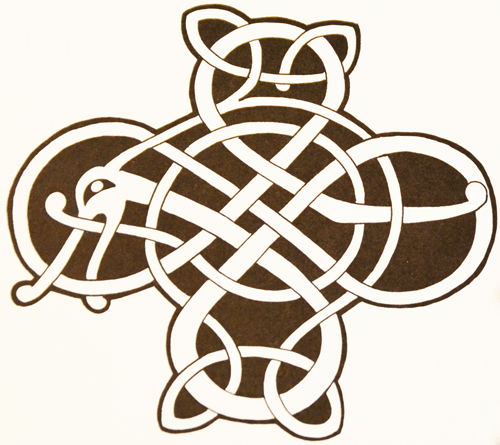 A pretty cool viking age design – you could for instance use if for embroidery. Layers. Excavations of rich Viking Age graves shows lots of layers in both wool, silk and linen. Fine fabrics. The Vikings were great weavers, and the fragments found are beautifully made. Plaid, twill, stripes, damask. pleats and embroidery. All of these techniques were known during the Viking Age. Embellishments. Trims, cords, pleats and embellishments in silver, bronze and gold. Jewelry. Brooches, beads, necklaces, rings, bracelets and pendants. Coins were sometimes used as jewelry as well. Helmets with horn. That is completely fictional. In fact, very few Viking Age helmets are found at all, none have horns or feathers. Velvet. Velvet wasn´t part of the Viking Age fabric sources. Synthetic colors. Sourcing fabric for this could be a challenge, but look for warm, natural colors. The Vikings could produce beautiful colors, just know that clear blue and reds were very expensive. Princess seams and button-up shirts. Keep it simple with rectangles and triangles sewn together in various ways. The exception is circular cloaks. Corsets and extremely fitted garments. We have no evidence of this type of clothing from the Viking Age. I hope that is a good starting point for you all! This giveaway is now closed. Thank you so much for participating. Winners will be announced shortly. As I wrote earlier, the Vikings liked to embellish their clothes, and one popular way of doing that was using tablet woven trim. I have spent some time over the years learning how to weave with tablets, and I have made more trim than I can use myself. So I thought it would be fun to help you guys out, and would like to offer up some tablet woven trim for a giveaway. Just leave a comment below stating which trim is your favorite- trim A, B, C, D or E. Five lucky winners will get their very own tablet woven trim! Each of them are shown in detail below, stating the length and width for them as well. The giveaway is open for everyone around the world, of course. Please make sure to leave your e-mail address so we know how to contact you! The giveaway ends one week from now – Tuesday the 25th of February at 17.00 Central European Time. Trim A: White, purple and green, 100% linen. 172 cm/1.8 yd long. 2 cm/ 3/4″ wide. Trim B: Green and two shades of purple, 100% wool. 4.26 m/ 4.6 yd long. 4 cm/1.5″ wide. Trim C: Two shades of heather, 100% wool. 2.17 m/ 2.3 yd long. 4,5 cm/ 1 3/4″ wide. Trim D: Yellow and purple, 100% wool. 122 cm/ 48″ long. 4 cm/ 1,5″ wide. Trim E: Two shades of purple, 100% linen. 147 cm/ 58″ long. 2,5 cm/ 1″ wide. Note that trims A and E are woven in linen, the other three are made from wool. The general rule is linen trim for linen garments and woolen trim for woolen garments. This is mostly because of shrinkage. Remember that the wool is prone to shrinkage! Fascinating post! I love all the trims, but my favorite is A. Thank you so much for sharing! Such fascinating history and culture involving textiles! I love that magic was part of everyday life and everyday things. 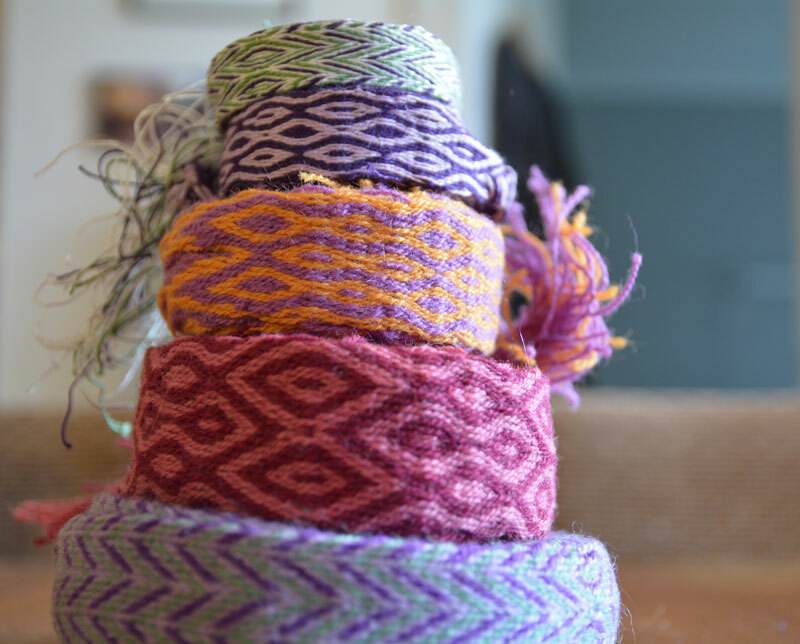 Your woven trims are gorgeous! I especially love the yellow and purple in D.
Wonderful post! Love the detail about decoration and colours, actually loved the whole post. I like all the trims, they are beautiful. Any one of them would be accepted with squeals of delight! What a fascinating post – jag alskar det! And your trims are so beautiful, I love the blue one (b?) – how wonderful that you’ve learnt. so interesting to think that many of those trends define Scandinavian design now too – boxy clothes, natural materials, organic designs …Thank-you for the inspiring post! Great post! Especially the part about the magic in everything! Wonderful. The trim I like best is E.
I am in love with c. Any evidence the Vikings knitted? Thank you so much for the informative post. Thanks so much for sharing this post! I really like trim A.
I love your simple list of ‘Do and Don’ts’. 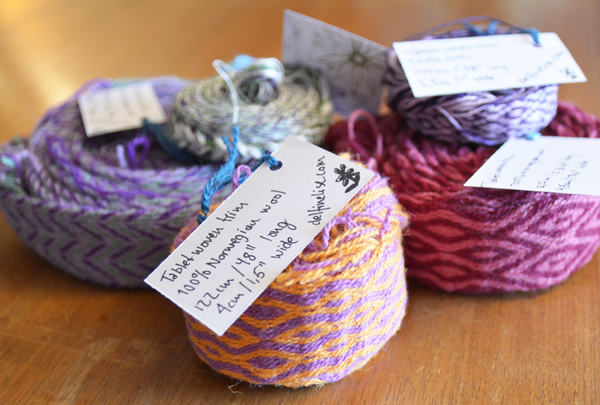 I’m also loving the colours in trim A, they’re all gorgeous, but that one just pops out at me. Wow. This was super informative and basically told me everything I was thinking about doing is Viking inaccurate although I wasn’t going to do horns. 🙂 Thanks so much for sharing all this great history! I really like the colors of Trim C although they are all beautiful. Thanks for being willing to share such a unique trim. Thanks for the informative post! I’ve studied Viking literature, and we touched on some things about clothing (like the law about not wearing open-chested shirts – is it Laxdaela Saga where that one comes up?) but mainly in terms of their social significance; we didn’t cover the archaeological evidence or actual physical construction at all. Also, that PDF you linked of patterns and construction guidelines is going to be veeeery useful to me as a LARPer, I suspect. Thank you again. Solvi, you are a wealth of information! This post was so enjoyable to read and I feel a bit smarter now thanks to you. Who knew that the whole viking horned helmet is entirely fictional? Thanks so much for the chance at the giveaway – all the trims are lovely but if I had to pick just one I would go with “C”. Those shades of heather are right up my alley. Thanks again! Solvi, I really loved this post. Thank you! I’ve always dreamed of working as costumed interpreter in a museum, so it was really cool to hear about what you’ve learned from your experience! I’m so curious to see what the Sewcialists sew in March! I can’t choose between all the trims – so count me in for any of them! 😉 Thank you! Thank you for such a brilliant post Solvi. When this theme was decided I really wanted to join in but had no idea where to start, your post has made re-inspired me. Gorgeous trims, I’m definitely going to have a go at making some! Trim D is my favourite. For some reason I’m in love with yellow and orange together. They all look beautiful, but this is definitely a winner for me. I may also make him an over-tunic in a light coloured wool, but that depends on time! I think that any of the trims would look great with the wool over-tunic, but trim A would work best with the linen under-tunic, so I’ll pick that one! I enjoyed reading about viking history. Especially about the fabrics they would actually use. Thanks for such an informative post! I do love historical costuming, even though I’d already decided to go more the fantasy route for this particular sewalong. Hey there, You’ve performed an excellent job. I will certainly digg it and personally suggest to my friends. I am currently in the process of constructing a Viking costume for SCA. I am however struggling with colors and types of fabric. I currently have a deep purple and olive green for dress and apron dress but am thinking those are totally wrong! They are linen and the only colors besides bright red or orange that the store had. Another issue I am having is what wool to use for a cloak (or clothing in general) I bought a wool felt type material and it is very stiff. Will this work. I could use some serious specific direction. Help! Where did you buy your trims? I can’t seem to find a store that sells them. my husband and I are returning to the SCA and decided to go where neither of us have gone before in personas and take Norse/Viking personas. We are currently researching everything we can, which of course lead me to your site. Thank you for your wonderful information. As a fiber artist, I cannot wait to begin making my own trim in time. But until I do, any of your trims would make for a great start. I believe I will try my luck with B! This is a relevant to my recent trip to Norway!